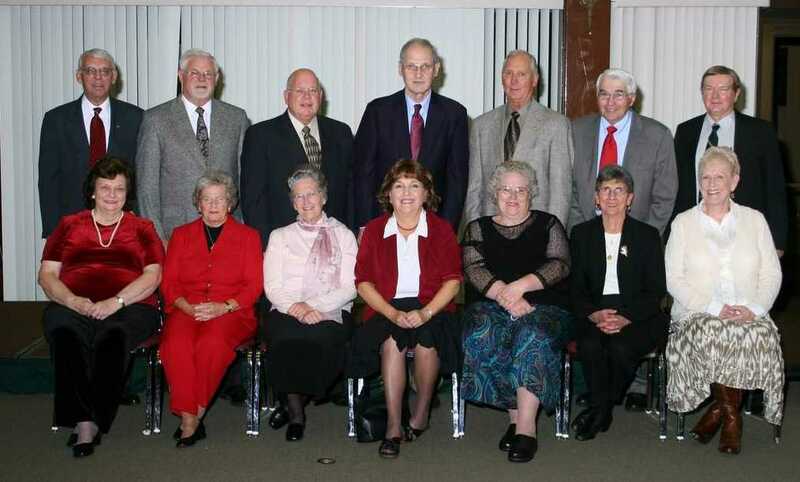 This "Lost In The Fifties" reunion concluded a series of Golden Anniversary celebrations by the WHS Classes of 1953, 1954, and 1955. We had excellent cooperation between the reunion committees of each Class and the success of these reunions was the result! First Row, L to R---Janet Belcher Gramlich, Jackie Poe Lose, Betty Richardson Abbott, Helen Green Lang, Patty Flanagan Paukstis, Rosalie Cherricozzi Hurt, Beverly Pigg Chipouras. Second Row---Gerald Eden, Max Willard, William "Bud" Facello, Frank Caperton, John Thomas, Jimmy Anderson, Richard Day. First Row, L to R--Judy Hulme Beuchert, Shirley Wade Kim, Barbara Quesenberry Mayo, Shelby Caudle Natole, LouEllen Parsons Sharp, Joyce England Fly, Ardella Roberts Shaftstall, Edna Large Jackson, Mescal Greer Korman, Martha Phipps Shirley, Peggy Tolley Peery, Nelle Pollock Kost, Maria Sagris Herrey. 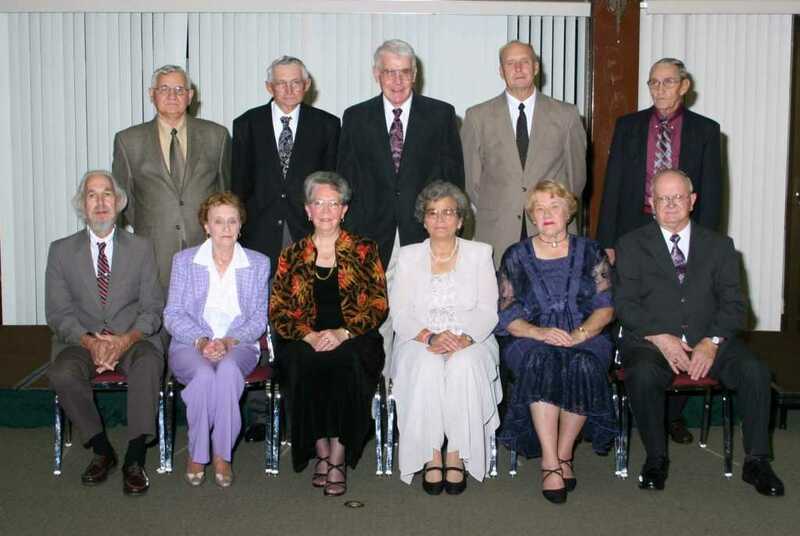 Second Row--Don Rankin, George Counts, Paul Chapman, Patricia Henderson Foster, Ed Fly, Joann Belcher Westbrook, Patricia Jones Coffman, Gwen Martin Lucion, Dolores Gesotti McMahon, David Atkins, Larry Hylton. Third Row--Gerald French, Neal Scott, Larry Matney, Walter Foster, Joe Sinicrope, John Summers, Henry Lucion, Frank Marino, Wayne Richardson, Ray Hunt, Bill Tolley. 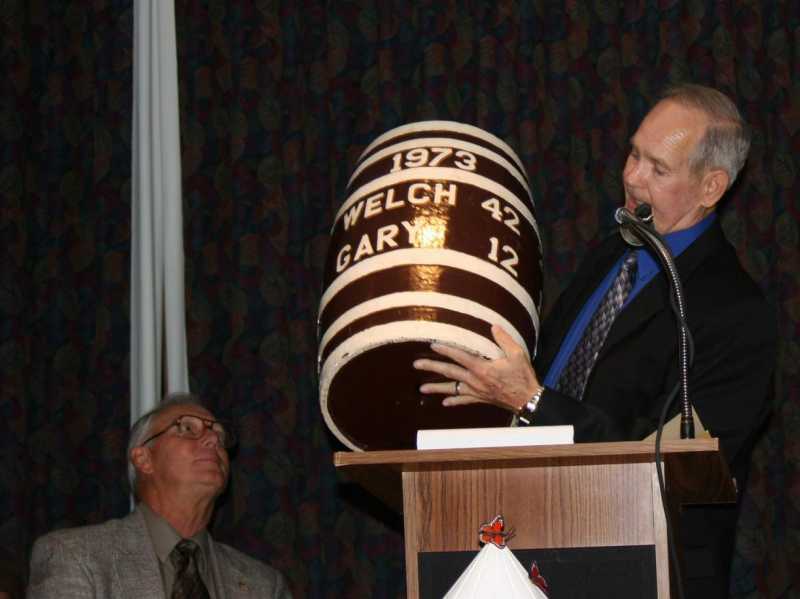 We would like to note that the REAL BARREL is in the hands of Dr. Mark Manchin and the McDowell County Board of Education. A Certificate of Appreciation for retrieving the barrel from archives was presented to Dr. Manchin by Gwen Martin Lucion, on behalf of the Class of 1955. We are so pleased that Gwen was able to secure permission for us to display the REAL BARREL at our reunion. The permanent location of the REAL BARREL will be at Mount View High School and is to be placed there when an appropriate and secure trophy case can be constructed. Presently, we have no timeframe as to when the actual placement of the Barrel at Mount View will take place.